You will be amazed to learn that the blue and the green in the image at the top are the same color! I found the image here and there is further explanation here. 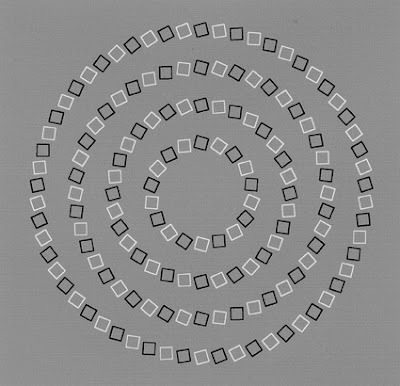 The illusion in the center appears to spiral, but it is in fact made up of 4 circles that do not touch each other! The image is here and is from the blog of psychologist Richard Wiseman. Your eyes alone are animating the illusion at the bottom, which I found here with a tip on how to make the movement stop. The powerful illusion here is called the Pinna-Brelstaff illusion and is animated because moving toward and away from the static image causes the rings to rotate. I first saw it at a Ripley's museum. 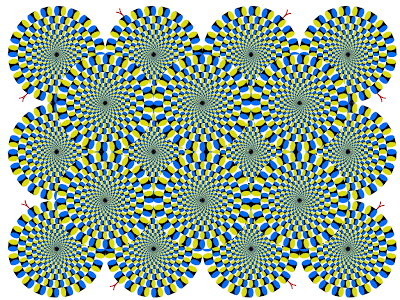 The example and explanation are among 84 Optical Illusions and Visual Phenomena on the website of German professor of opthalmology Michael Bach. It is this site that I have found to be the most accessible, comprehensive, and informative regarding optical illusions - though I have only scratched the surface.